If you’ve ever asked yourself, what is the best body wash for men, you’re in luck. We just spent a lot of time looking into this. To figure out what is the best body wash for men, we researched some of the old, classic brands and some new smaller ones you might not know about. Then, we put together these men’s body wash reviews to find an answer. Before we get started, let’s look at some of the features you need to know. Aloe - Aloe Vera is a succulent that has been used medicinally for a long time. There are a lot of benefits to using Aloe Vera on the skin. It soothes, moisturizes, and is loaded with vitamins and nutrients that nourish your skin. Organic - An organic body wash is one that’s made with all natural ingredients. It won’t have any synthetic additives or preservatives. Any plant material used would have been grown without pesticides or fertilizers. Plus, there aren’t any artificial dyes or scents. Paraben Free - Parabens are something added to body washes to prevent bacterial growth. They’ve been used widely since the 1950s. Some research has come out that they can mimic estrogen, which can bring a whole host of other problems. Scented - All of our top picks are scented but to a different degree. Some of the organic options don’t have strong smells that will stay with you all day. Others promise to keep you smelling fresh for 24 hours. Sensitive Skin - Products that are good for sensitive skin will often be hypoallergenic to try to avoid any reactions. They’ll also likely not have a lot of alcohol in them because that could dry out skin even more. Weight - This is the size of the bottle and they vary pretty drastically. The largest is 23.5 ounces and the smallest is only 8. This is a good thing to keep in mind when comparing prices. Now that you’ve looked over our brief body wash buying guide and know a little more about what to look for, it’s time to get into our reviews. The first 2 items are our top and budget picks. This is a great place to start if you’re running short on time because it shows you the range in what’s out there. The rest of our products are great, too, and there’s a bit of a variety! Alright, let’s go. Our top pick for the best body wash for men is Pre de Provence No. 63. First of all, the smell is wonderful. It just smells like a man. What do we mean by that? This scent has a leather and tobacco base with hints of cedar, pepper, and just a dash of citrus. We also really love that it’s a 2-in-1 product. You can use it as body wash or shampoo. Not only does it clean and rinse away easily, it’s also gentle on your skin thanks to the Aloe Vera and shea oil. It leaves your skin feeling soft and smooth. Plus, you smell great without it being overpowering. Pre de Provence also made No. 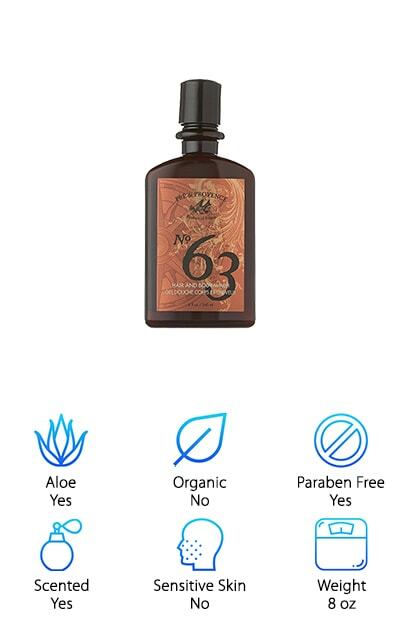 63 free of parabens, sulfates, and phthalates and they never test on animals. If you’re on a tight budget, don’t let that stop you from using a top body wash for men. That’s what our budget pick is for! 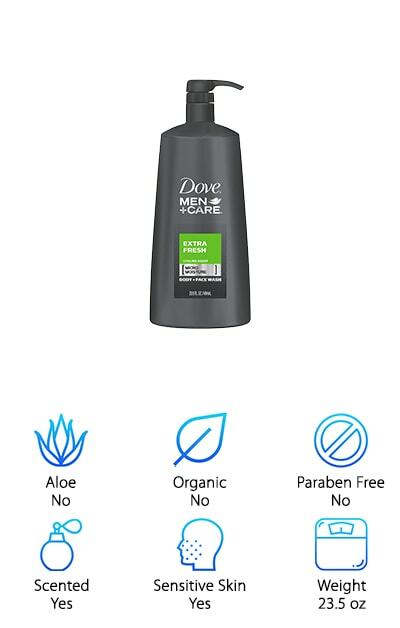 Take a look at the Dove Men+Care Body Wash. Dove is one of the most well-known bands when it comes to affordable skin care and they developed this formula specifically for men’s skin. The formula might seem ultra-light when it comes out of the bottle but it’s activated when lathered. It hydrates your skin and helps ward off future dry patches. In fact, it’s gentle enough to use on your face. This is also a good pick for anyone with sensitive skin. It’s hypoallergenic and contains menthol to help cool and irritation. And get this, it’s tested by dermatologists. In fact, it’s the number 1 dermatologist-recommended brand. 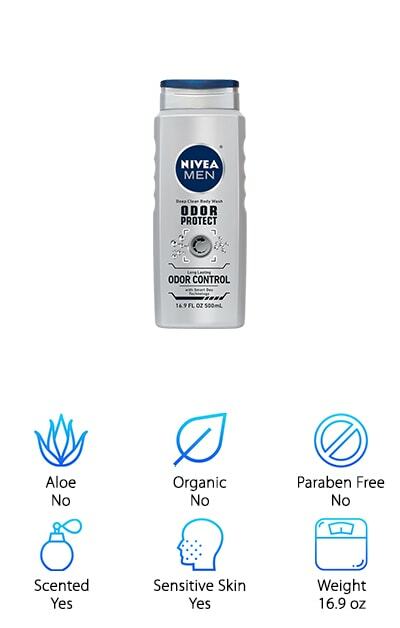 Another best men's body wash that’s super affordable is the NIVEA Men Odor Protect Body Wash. This is a really good choice for a guy with an active lifestyle. First of all, it’s quick because it’s a shower gel and shampoo in one. It’s also made to remove odor-causing bacteria, sweat, and the general ickiness you might be facing after an intense workout. It lathers up really well and rinses away easily so it won’t dry out your skin. That fact that it’s affordable really adds to its appeal. If you’re taking a shower in the morning before work and another in the afternoon after the gym, you’ll be going through a lot of product. Wouldn’t it be nice if that product was easy on the wallet, effective, and great smelling at the same time? 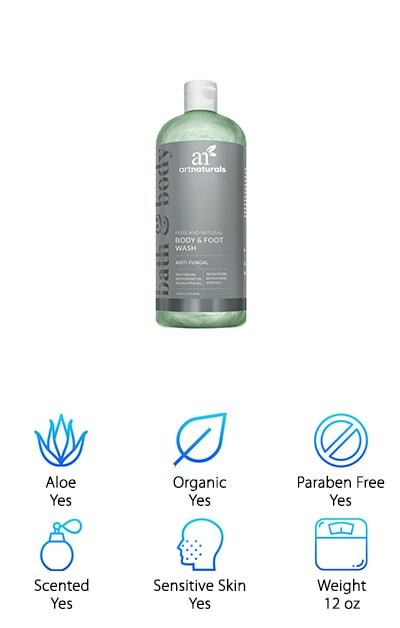 ArtNaturals Tea Tree Body Wash is one of the best smelling body wash men love. It’s a nice, light scent with hints of peppermint and eucalyptus that won’t overpower. One of the best things about this pick is the benefits of the natural properties of the organic ingredients. What do we mean? The natural botanical oils in this body wash have antiseptic, anti-germ, and anti-fungal properties. While this is a great choice for soft, smooth skin, it will actually give you more benefits than that. 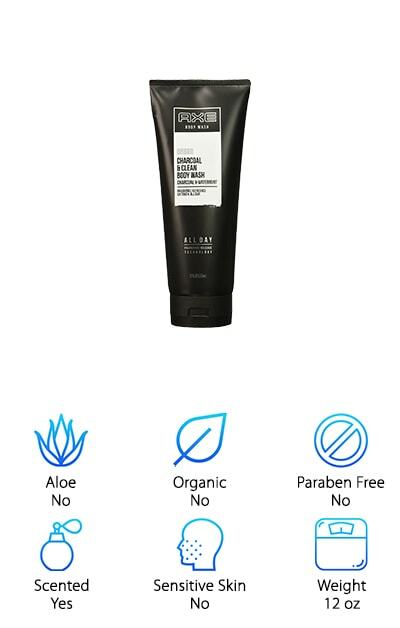 What botanicals are incorporated into this formula? Tea tree, eucalyptus, peppermint, jojoba, chamomile, and Aloe Vera, just to name a few. This one is also a great choice for an active lifestyle. The anti-bacterial and anti-fungal benefits can eliminate a lot of what causes bad odors after a workout. Old Spice. It’s been around since the late 1930s and there’s a good chance your grandfather (or even great-grandfather) might have used it. 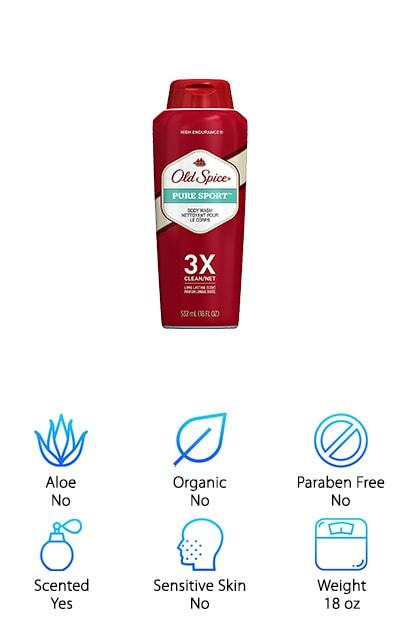 It has staying power, for sure, which is part of the reason why Old Spice Pure Sport Body Wash is a best body wash for men. Why is it this Pure Sport Body Wash one of the best? It gets rid of odors, from the ones other people can smell to the microscopic little organisms that will cause problems later. That’s why it’s so great for athletes! The smell is classic Old Spice. It’s not overpowering and sticks with you for a little while once you’re out of the shower. But there’s more to this body wash than the smell. It also washes away clean and leaves your skin feeling nice and smooth. AXE is a pretty well-known brand and we had to choose this Charcoal and Clean variety as an option for best shower gel for men. What’s so special about it? It keeps you fresh all day with its touch release technology. As you go throughout your day, all you have to do it touch your skin and you’ll release little bursts of freshness left behind by your morning shower. The charcoal and mint really give your skin a deep clean, too. You might think of AXE as being a brand for teenagers but everything about this one is just right for men who are grown. The packaging is sleek and sophisticated looking and the smell is actually pretty sophisticated. It’s manly without being overpowering and has just a hint of sweetness. 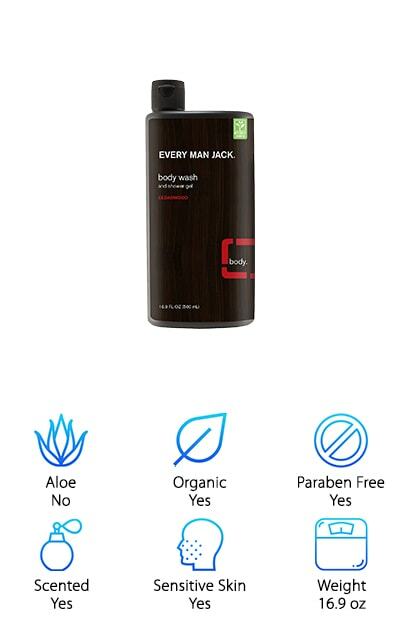 When it comes to Every Man Jack best body wash men will be happy to know that it’s 97% natural. In fact, that’s what the company was founded on, the idea of naturally derived formulas made out of the best ingredients for you and the environment. This Cedarwood variety smells great and gives your skin a deep, thorough clean. Plus, it protects your skin and doesn’t leave it dry. The smell isn’t too strong. It’s a light cedarwood smell that won’t interfere with your cologne. That’s not all, the packaging is made of 50% post-consumer recycled plastic. All of Every Man Jack’s products are certified Cruelty Free by PETA because they never test on animals. Everything is made in the USA, too. Plus, this body wash is phthalate, paraben, and dye free. You might be wondering, what makes a good body wash for men? Well, one of the main things a good body wash should do is prevent odor. And that’s what is so great about Irish Spring Body Wash. It doesn’t just leave you smelling good right out of the shower. It actually has odor neutralization technology that provides 24 hours of freshness. How does it work? Rather than just controlling odors and masking what’s already there, Irish Spring eliminates odor at the source. The rich lather will leave you feeling really clean, too. This is another choice that’s a really good buy, you get a large 18 oz bottle for a reasonable price. 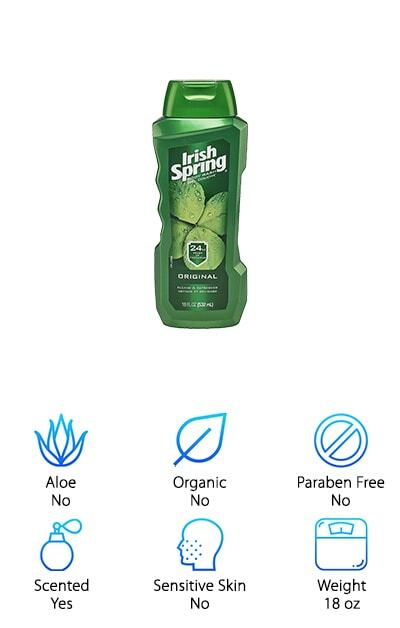 Irish Spring has been around since 1972 and their classic fresh scent promises to get you clean like an Irishman. 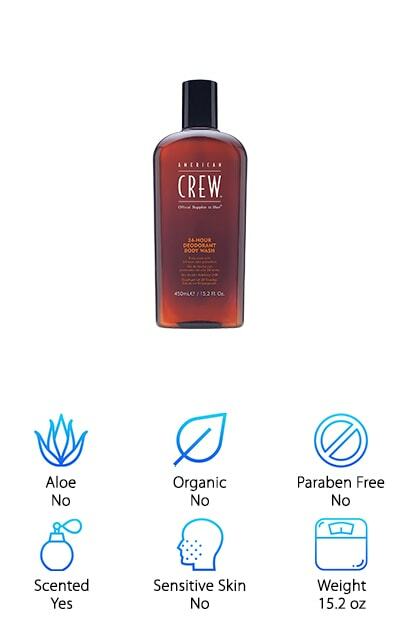 Next on our list of best shower gels for men is American Crew Deodorant Body Wash. Some of the ingredients are derived from raw vegetables which help eliminate the microorganisms and bacteria that will lead to bad odors. This is a salon brand that was created in 1994 as a way for men to put more effort into their appearance while being able to feel manly. It was an idea that took off and it still going strong more than 10 years later. This body wash soothes and deep cleans your skin leaving you feeling crisp and fresh for the day ahead. One more thing, the scent is a little different than the others that we’ve reviewed so far. Rather than having notes of tobacco and various woods, it has a crisp peppermint smell. If you’ve been waiting for the best moisturizing body wash for men, your wait is finally over. 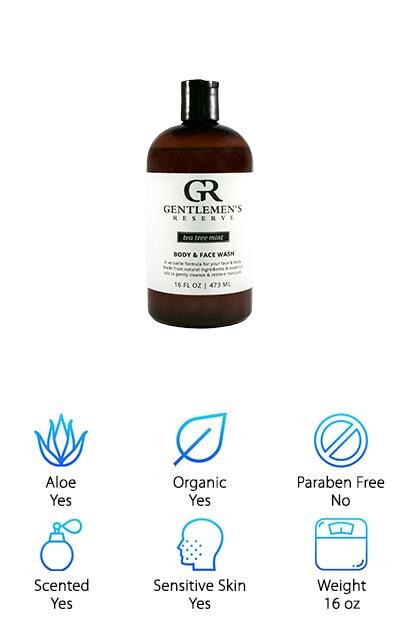 Gentlemen’s Reserve Organic Wash is great for all skin types, especially dry skin. There are no parabens, sulfates, alcohol, or silicones. Among its many natural ingredients are extra virgin olive oil and Aloe Vera, both ideal for dry skin. Olive oil is full of antioxidants to help improve your skin health and Aloe Vera is loaded with nutrients and vitamins to help smooth your skin and keep it healthy. It also has tea tree oils to help clear skin and rosemary extract to lighten dark spots. This is such a gentle and effective wash that it’s great to use on both your body and face. The smell is great, too: a light mint that helps you feel clean without being overpowering.